Former President Mahinda Rajapaksa was sworn in as the new Prime Minister of the Democratic Socialist Republic of Sri Lanka before President Maithripala Sirisena at the Presidential Secretariat last evening. Picture by Sudath Silva. Former President Mahinda Rajapaksa was sworn in as the new Prime Minister of the Democratic Socialist Republic of Sri Lanka before President Maithripala Sirisena at the Presidential Secretariat last evening. 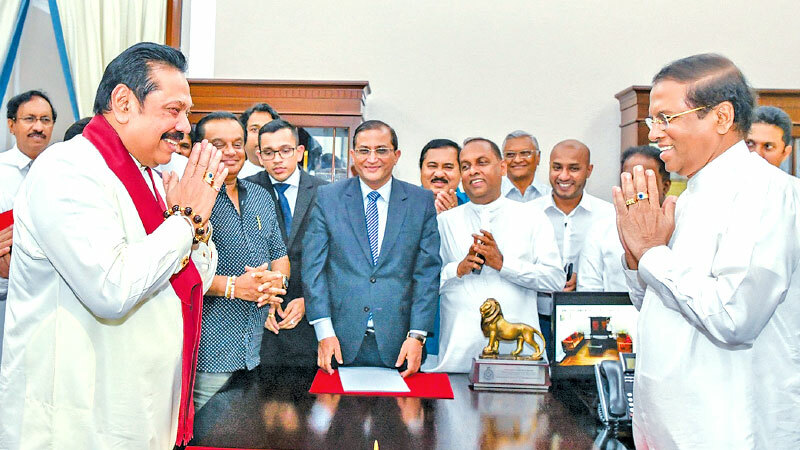 His swearing-in ceremony was held after the United People’s Freedom Alliance (UPFA) officially conveyed its decision to part ways with the coalition government. It is reported that party members had expressed their displeasure over the conduct of the good governance government to Speaker Karu Jayasuriya yesterday evening. Prime Minister Mahinda Rajapaksa is a lawyer and has been engaged in active politics in the country for the last five decades. He was first elected to Parliament in 1970. He held the Prime Minister portfolio from April 6, 2004 until he became the President of the country in 2005. He was first elected as the President of the country on November 19, 2005. He was re-elected on January 27, 2010 for his second term as the President of the country. Prime Minister Rajapaksa as the then President of the country was internationally recognised and appreciated for his leadership in defeating the barbaric terrorism of the country in 2009. A large gathering of politicians and the supporters of the United People’s Freedom Alliance and the Sri Lanka Freedom Party got together in front of the Presidential Secretariat to convey their wishes to the newly appointed Prime Minister. Supporters of the UPFA and the SLFP throughout the country celebrated the appointment of the new Prime Minster with firing crackers.